There are lots of blogs that repost photos of cool-looking places. Usually these websites give very little information even identifying the location shown in the photo, much less practical tips on how to travel there. Spot Cool Stuff is a different in this way. We aren’t about spreading memes. 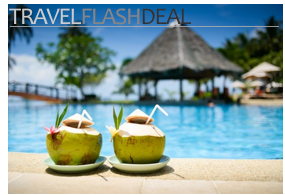 Our travel blog is about discovering cool travel ideas. It’s about finding tips for getting out and exploring this amazing planet of ours. Because, a photogenic place is so much more than a piece digital eye candy. It’s a real life destination that anyone (appropriately equipped with a plane ticket, passport and credit card) can to go see. The establishment’s real name is the Fangweng Restaurant. 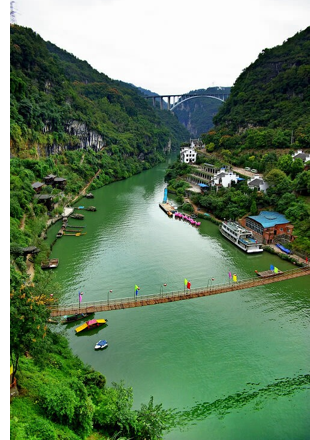 It’s in China, in Hubei Province, about a 12km, 30 minute drive north of the city of Yichang. The Sanyou Cave, or “The Cave of the Three Travelers,” is indeed one of the nearby attractions. 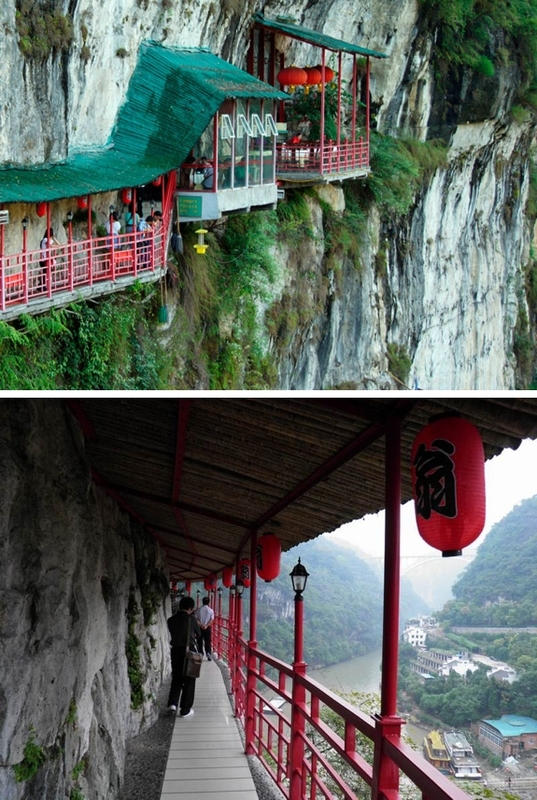 But more generally, the restaurant is in the Happy Valley of the Xiling Gorge, an especially scenic stretch of cliffs, caves and park land located around area where the Chang Jiang River flows into the Yangtze. It isn’t until you pass through this building that you appreciate what a precarious walk you have to your table. On your left, there’s the limestone cliff face shooting virtually straight up. On your right, there’s a railing that somehow doesn’t seem to the task of keeping a human from plunging down into the river far below. 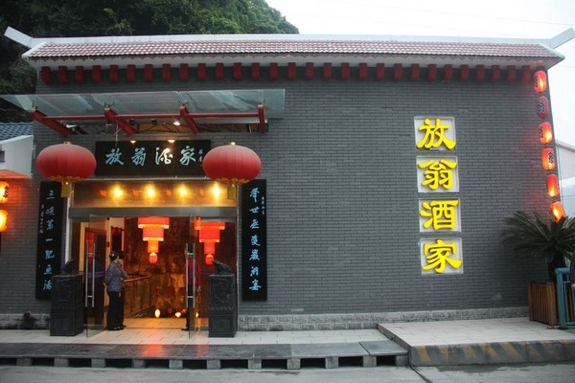 As for the restaurant itself, the menu is an amalgamation of local specialties and Hubei cuisine standards. Many entrees feature freshwater fish. Others have duck, pork and even turtle, usually smothered in vegetables and/or a sauce heavily spiced by chili powder and hot peppers. 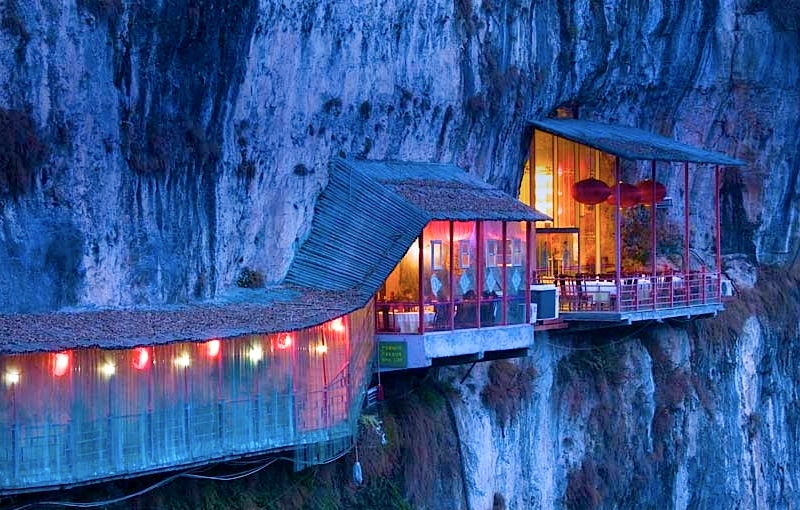 A few select tables are located on a deck that extends out from the rock face. But most of the seats are inside a natural cave. 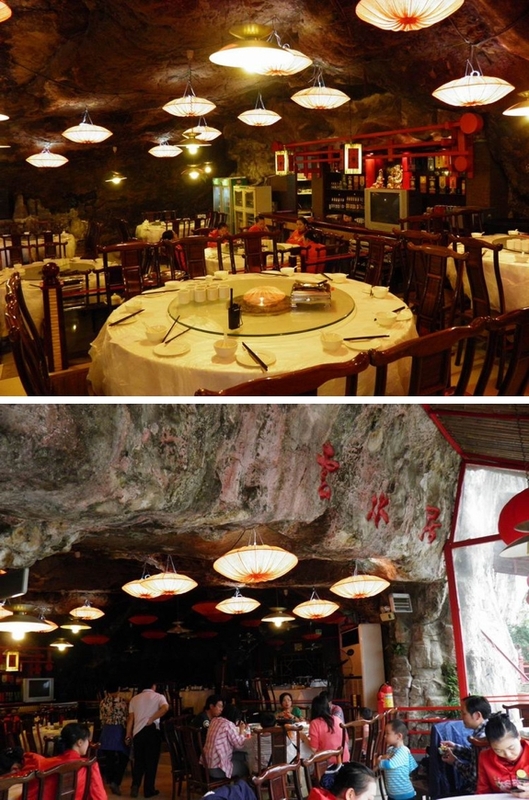 There are no views from here; the dinning experience on offer is a surreal combination of being in a generic Chinese restaurant and eating in the Bat Cave. The Fangweng Restaurant is open for all day long. At the time of writing, the hours were from 9am to 9:30pm, but these things can change sudenly so if you or some one you know speaks Chinese we’d suggest calling to make sure: 0717-8862179. We suggest visiting for an early lunch when the restaurant isn’t crowded and the light lends itself to good views. 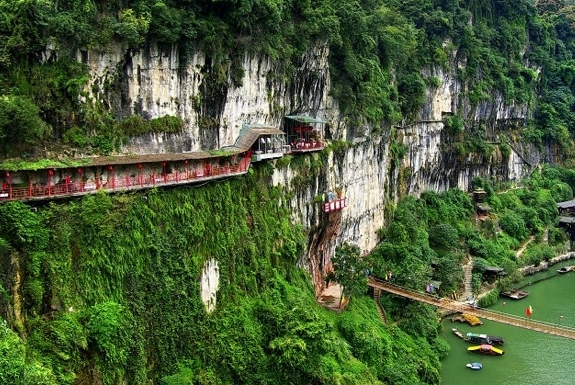 The Xiling Gorge is popular with tourists and there are lots of local activities, including hiking, bungee jumping and boat trip — not to mention the tour of the Sanyou Cave. I am never a fan of heights but just for the experience, I think I’ll try this one anytime I can! Thanks for the idea!